A beautiful and eye-catching trend in interior design is in the details — and iridescent. Iridescence is uses various finishes or materials to create a variety of shifting colors with a high sheen. The look of an iridescent item changes, depending on how you’re looking at the item as well as the lighting around it. Light appears to be captured within the surface and reflected back into the room. 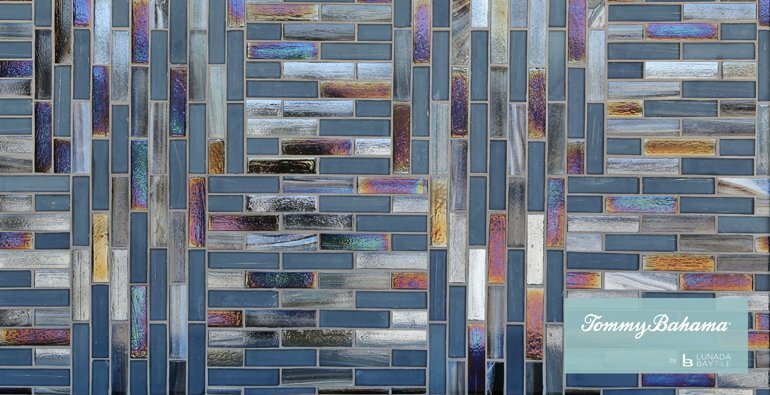 Iridescent decor can range from selections of glass tile to fabrics and textiles. Iridescent fabric can be made synthetically or out of silk. These type of textiles are great for pulling a room together, since many colors can be seen throughout the material. This is a trend that will look most at home in contemporary interiors, but it can also be implemented in traditional and even naturalistic decor. In traditional decorating schemes, this finish is lovely on accent tile in a small guest bathroom, bringing an unexpected glint of light. In a home with natural decor, the presence of iridescent cloth in the living room or a wall of iridescent tile in the master bath brings to mind flowing water or sunlight glinting on the surface of a river. Iridescent glass tiles used in a backsplash instantly add a dash of glamour to any kitchen, no matter the style! Use iridescent items or finishes in spaces where playful color is needed, since it combines many colors into one finish. Indirect light brings a beautiful soft glow from these surfaces, while direct light can reflect back into the room. Make sure to play with light sources nearby to find the effect you wish to achieve! Get creative and play around with this design trend. If you would like to see how this beautiful fashion could work for you, please contact us through our website or visit us at one of our showrooms. Our consultants are always happy to help!